In a dramatic reinvention of Sakura this year, Sake no Hana, in collaboration with Perrier-Jouët Champagne, has commissioned leading paper artist Lydia Kasumi Shirreff to create a Sakura inspired art installation at their Mayfair Japanese restaurant. Spring is the perfect time to visit Japan. The Japanese cherry tree comes into blossom covering the country with a delicate pink canopy and Sakura is the traditional Japanese celebration of the cherry blossom. If you can’t visit Japan, the next best option is to find a good Japanese restaurant which is celebrating Sakura. 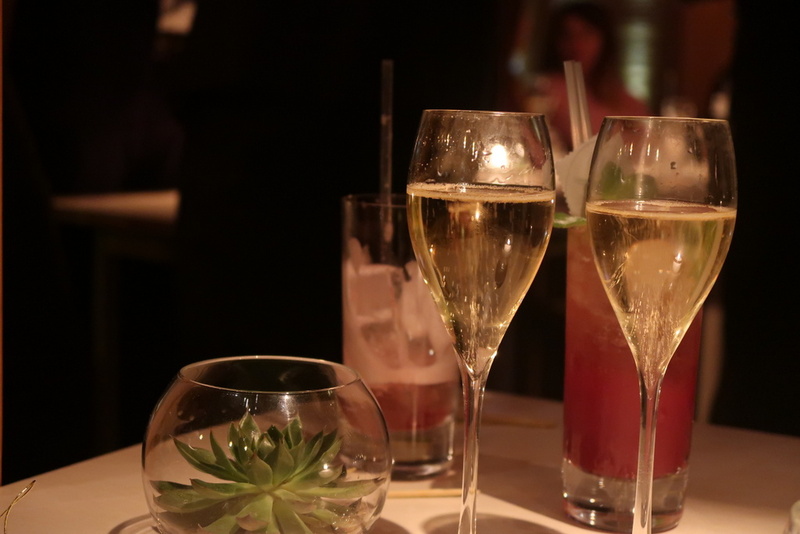 I was delighted to be invited along to Sake no Hana, the contemporary Japanese restaurant by internationally acclaimed Hakkasan Group, for the launch of their new Sakura menu a celebration that signifies the start of Spring and the Japanese blossom season. 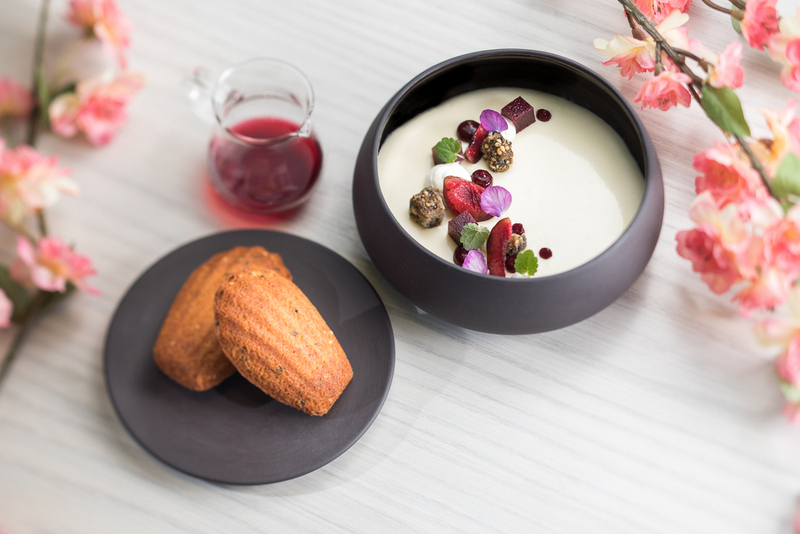 They have created a limited edition menu and are collaborating with Perrier-Jouët Champagne, famous for their iconic Japanese anemone adorned bottles, to celebrate a marriage of art and food. The Mayfair Japanese restaurant has commissioned acclaimed artist Lydia Kasumi Shirreff to transform the space, following the success of her recent Chinese lantern installation at sister restaurant Yauatcha City. With a background in fine art, Lydia has been dubbed ‘the queen of paper sculpture’ and has created a beautiful installation in which large paper blossom sculptures float in cloud-like formations from the ceilings. Lydia’s interpretation of the Sakura theme has been inspired by hana fubuki, a Japanese phrase that directly translates as ‘flower snowstorm’ or ‘cherry blossom blizzard’. 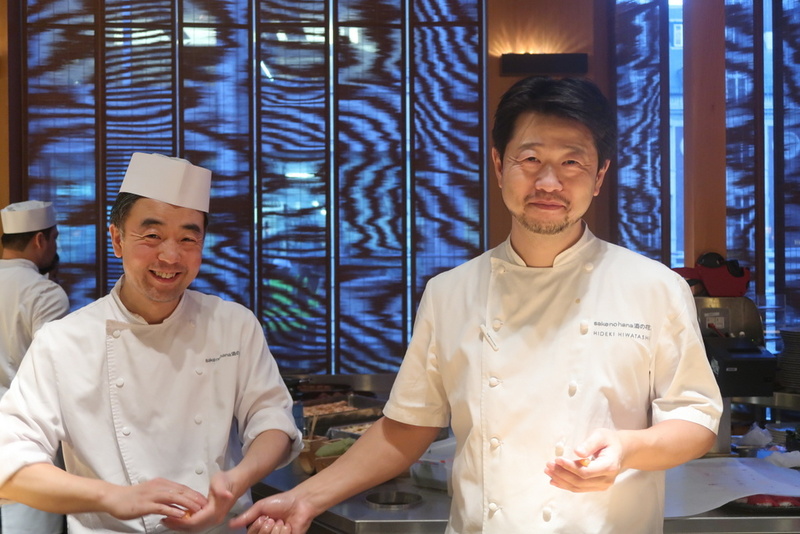 We were welcomed with a perfectly chilled glass of Perrier-Jouët Champagne and offered some mouth-watering canapés, which were based on dishes from the new menu, which has been created in tribute to the season, by Sake no Hana’s esteemed Head Chef Hideki Hiwatashi. He has created a special four-course Sakura Supreme menu to pair with the fresh, citrus character of the recently launched Perrier-Jouët Blanc de Blancs Champagne. Guests will begin with akadashi hirousu, a red miso soup with tofu cake, seaweed and chilli yuzu, followed by a selection of signature sushi. A bento box will comprise nigiri; maguro tuna, salmon, ama ebi and suzuki sasazushi, and maki rolls; spicy maguro, aburi salmon, crunchy kani maki and inari tofu. Diners will be offered a choice of main courses such as sakura salmon with yuzu miso and Angus beef sumiyaki with a chilli ponzu. To finish, guests will enjoy the delicate orange blossom pannacotta. We’ve reviewed the Sakura menu at Sake no Hana in previous years and it is always an immaculate and stunning presentation of delicious Japanese food. 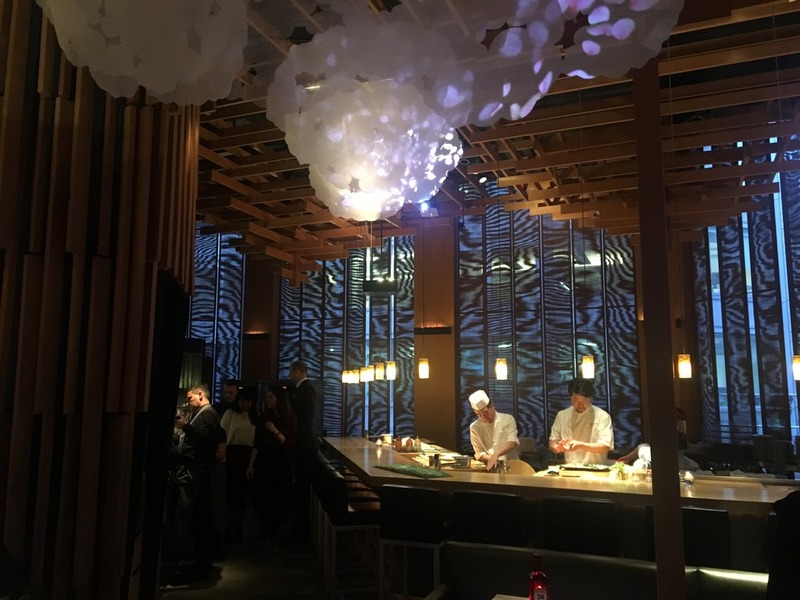 But this year, it is particularly special – so do make sure you book and go along to this Mayfair Japanese restaurant while it is so beautifully decorated. Hanami is the centuries-old Japanese tradition of celebrating the annual Sakura season by eating sushi and drinking sake beneath the cherry blossom trees. 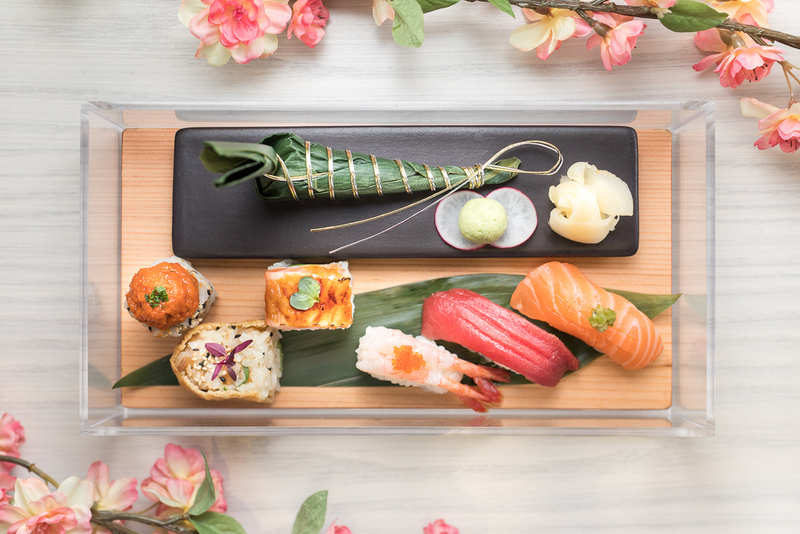 You may not be able to enjoy springtime in Japan but instead, you could experience a wonderful taste of Hanami in London’s Mayfair at Sake no Hana. The menu will be priced £38 per person including a signature Sakura cocktail, or £52 including a glass of Perrier-Jouët Blanc de Blancs Champagne. From Monday 19th March to Monday 18th June 2018. Open for lunch and dinner from Monday to Saturday.